SALVADOR, BRAZIL – With less than a week to the end of the year, the Brazilian film industry is able to look back at a successful year: over 120 national feature films were watched by nearly 28 million people, equivalent to 18.3 percent of the total box office. These are numbers not seen since the distant 1980s. Minha mãe é uma peça, a film by Paulo Gustavo, image recreation. This year may also go down in history for the diversity of topics covered. While Brazilian cinema covered mostly the nation’s social ills since the Retomada (a sort of Nouvelle Vague that began in 1995 with Carla Camuratti’s iconic “Carlota Joaquina”), 2013 saw three slapstick comedies reach the top of the box office. Leading this raunchy triad is André Pellenz’s “Minha Mãe é Uma Peça” (My Mother is a Piece). An adaptation for the silverscreen from a namesake impromptu, the film is a successful bet on the winning “cinema pipoca” (popcorn cinema) formula. This does not mean the Brazilian cinema has lost its verve for social commentary. Kleber Mendonça Filho’s “O Som ao Redor” (Neighboring Sounds) was received with enthusiasm by audiences and juries at some of the world’s major film festivals. The minimalist chronicle of a typical middle class street was described as “one of the strongest feature debuts of the last decade” by The Los Angeles Times. Gustavo Jahn and Irma Brown in “O Som ao Redor,” photo courtesy of Cinema Guild. 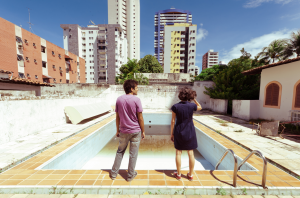 “[Neighboring Sounds] has enjoyed good release and box office considering it is an auteur film, and it has been received with utmost critical acclaim throughout the world, so I think it is also a door opener,” said filmmaker Marccelie Machado, who attended last month’s Semana dos Realizadores festival in Rio. The strength of Brazilian cinema is also evidenced by the decentralization of production, with films from outside the Rio – São Paulo axe causing a stir. In a market that suffers from an increasing share of dubbed foreign films, Halder Gomes’ “Cine Holliúdi” has something to say — and it does so with subtitles. That was the solution found after preliminary screenings of a movie spoken almost exclusively in regional slang. Until the end of November, “Cine Holliúdi” had been released only in the Northeast of Brazil. Still, the comedy about a hillbilly’s love for cinema was the tenth most watched film in the country. Previous articleEnvironmental Currency: Carbon Crypto Coins?